Mass produced, this item was crafted by an assembly line of underpaid, alcoholic wizards. A target within 60 feet must succeed on a wisdom saving throw of 15 or become under the influence of the Wand of DAMIT for one minute. 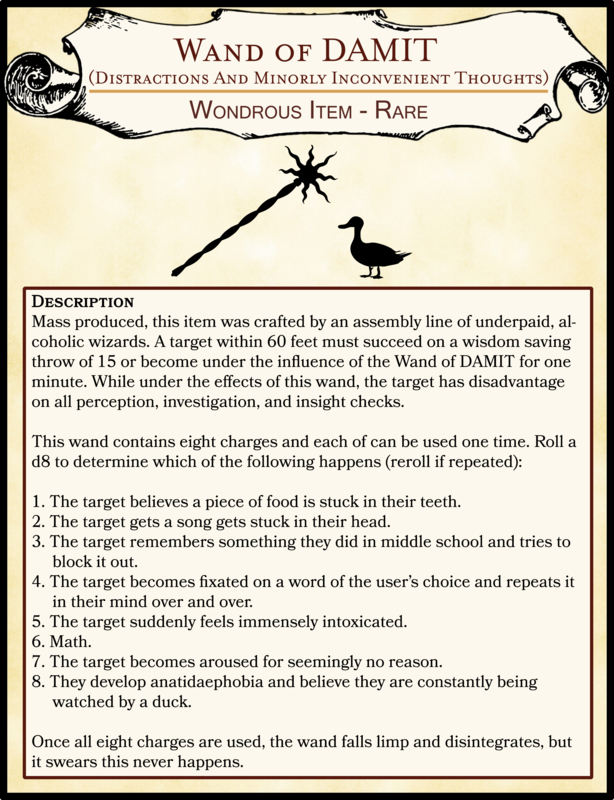 While under the effects of this wand, the target has disadvantage on all perception, investigation, and insight checks. 1. The target believes a piece of food is stuck in their teeth. 2. The target gets a song gets stuck in their head. 3. The target remembers something they did in middle school and tries to block it out. 4. The target becomes fixated on a word of the user’s choice and repeats it in their mind over and over. 5. The target suddenly feels immensely intoxicated. 7. The target becomes aroused for seemingly no reason. 8. They develop anatidaephobia and believe they are constantly being watched by a duck. Once all eight charges are used, the wand falls limp and disintegrates, but it swears this never happens.